Join us for a special reception in celebration of the opening of Fresh Paint! Take in ten unique, large-scale murals inspired by objects from our nine-million-item collection, meet the artists, and hear about their inspiration and the creative process behind each mural. Enjoy signature cocktails, beer, wine, and hors d'oeuvres; music by a local DJ; and after-hours access to the galleries. 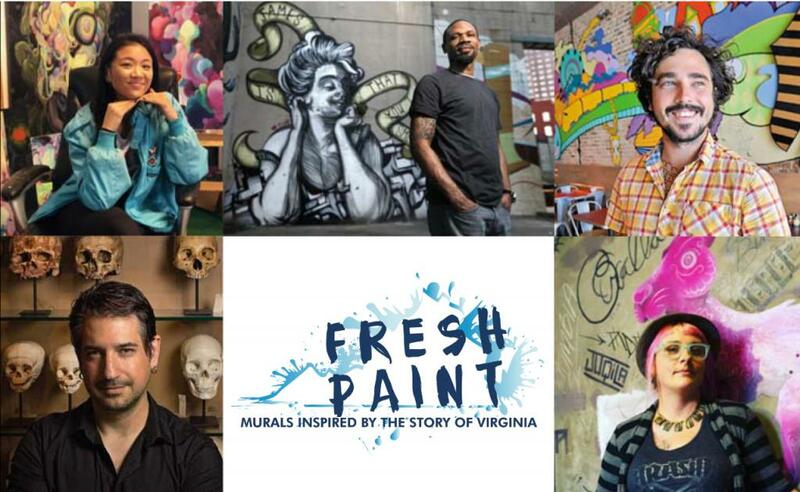 Pick up a signed copy of The Story of Virginia: Highlights from the Virginia Museum of History & Culture, a hot-off-the-press publication and the one that inspired Fresh Paint. The authors will be on-hand to talk more about their work. Tickets are limited for this intimate kickoff party, so get yours today! Event opens 6:00 pm. Join artists in the gallery for a ceremonial signing to officially open the exhibit at 6:20 pm, followed by a moderated conversation with the artists in the Olsson Gallery at 7:00 pm. This book by Jamie O. Bosket and William M. S. Rasmussen tells the history of Virginia through more than 400 objects from the Virginia Museum of History & Culture.